The fair and lovely Rose Quartz, with its gentle pink essence, is a stone of the heart, a Crystal of Unconditional Love. It is used to balance emotions and bring peace and calm. This calm emotional balance brings stress relief and easing of anxiety. Rose Quartz also inspires the love of beauty, in oneself and others, in nature, and especially that which stimulates the imagination - art, music and the written word. Prized in the ancient world for its powers of physical beautification, facial masks of Rose Quartz have been recovered from Egyptian tombs, thought by the Egyptians and Romans to prevent wrinkles. It was also a stone honored by the Tibetan and Oriental cultures, and continues to be one of the major carving stones of China. A silicon dioxide crystal, Rose Quartz is one of the most common varieties of the Quartz family and it is found in abundance around the world. 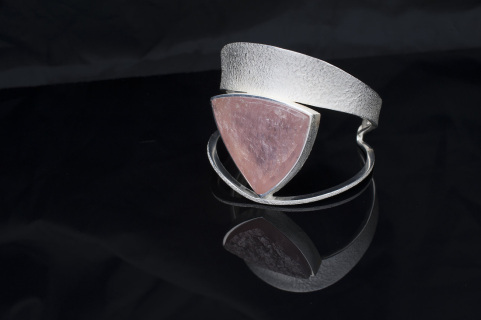 This dominant handmade sterling silver cuff with rose quartz is a real statement piece, for it brings something new to look at, every time you wear them.